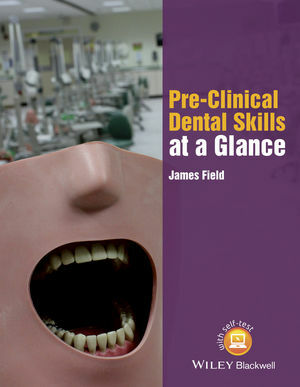 Pre-Clinical Dental Skills at a Glance provides a comprehensive and accessible guide to the basic operative skills and core clinical skills required of those about to embark on dental clinical training. It serves as the perfect illustrated introduction for pre-clinical students and a handy revision guide for subsequent undergraduate and postgraduate stages. Following the familiar, easy-to-use At a Glance format, each topic is presented as a double-page spread with text accompanied by clear colour diagrams and clinical photographs to support conceptual understanding. Pre-Clinical Dental Skills at a Glance is a valuable resource for students studying dentistry, dental hygiene, dental therapy or dental nursing, as well as skills-based assessments such as the Overseas Registration Exam or the Licence in Dental Surgery. Dr James Field is a Lecturer in Restorative Dentistry and Degree Programme Director for the Masters in Clinical Dentistry at the School of Dental Sciences, Newcastle University, UK. He holds a Master of Arts Degree in Education and a Doctorate in the field of Dental Erosion. Dr Field has received international acclaim for his innovative teaching and is recognised as a Senior Fellow of the Higher Education Academy and a Fellow of the Academy of Medical Educators.